Are you getting enough sleep at night? If not, you can at least take a small comfort in knowing that you’re not alone. A survey revealed that 30% of all workers feel they don’t get enough sleep at night. The good news is that a neck pillow is often the perfect solution. A neck pillow allows you to sleep comfortably just about anywhere. Typically U-shaped, a neck pillow fits (obviously) around your neck. This allows the pillow to support the muscles in your neck, shoulders and back. When these muscles and associated pressure points are properly supported, you'll be able to comfortably sleep in just about any sitting position. Travel. By air, train, subway or more, a neck pillow lets you catch some zzz’s when you’re traveling from place to place. Car rides. As long as you’re not the one driving, a neck pillow allows you to comfortably rest in the passenger or back seats of basically any type of vehicle. At the office. While you can't sleep away the work day, a quick nap is a great way to refresh and recharge when spending long hours at the office or job site. Camping. Portable and durable, neck pillows are easy to slip into a backpack. Perfect for supporting your neck and head while you’re relaxing around the campfire. By the water. Oceanside, riverside, lakeside or even at the local waterpark, a neck pillow lets you rest and relax while lounging in the sun. Ever tried sleeping in a sitting position without a neck pillow? The result is often a pain in the neck – literally! But aside from comfort, neck pillows have a few other important benefits. People are busier than ever. This lack of sleep can lead to poor health, accidents, loss of productivity and other troubles both big and small. The ability to comfortably fall asleep anywhere isn’t just a luxury – it’s a necessity. Experts have found that napping for just 20 minutes in the afternoon can have tremendous health benefits. You’ll feel more alert, your mood will be improved and your immune system will be boosted. Sleeping with a neck pillow also benefits your body. When your body is properly supported, you’ll notice a decrease in headaches, neck pain, shoulder pain, arm numbness, eye strain and other maladies. Memory Foam. This synthetic material was created by NASA. Today, it's popular in the consumer world. Memory foam conforms precisely to your body's shape and weight. This provides more support than almost any other type of filling. Memory foam has a few drawbacks. After prolonged use, the foam can heat up and be a bit uncomfortable. Also, sometimes the foam has a weird, “chemical-y” smell. Fortunately, these problems are relatively minor overall. If the foam is too hot, simply stop wearing for a while and allow it to cool. The smell can be reduced with the use of a pillow cover. Down and Feather. This is another popular filling. Down and feather pillows aren’t particularly compact. They are very comfortable, however. A mixture of half down and half feathers is considered by many people to be one of the most comfortable fills possible. Air. Travel pillows can also be inflatable. Some pillows only need a few quick breaths while others are better inflated with a portable electronic device. The main benefit of inflatable pillows is how easy they are to transport. Deflated, these pillows easily fit into a backpack or carry-on. The last thing you need when traveling is another clunky object to carry around. Fortunately, most travel pillows are light weight and can be reduced in size. Typically, foam mattress neck pillows can be stuffed into a small travel sack. Some foam pillows can be reduced down to a quarter of their original size. Other travel pillows have straps or buttons. This allows them to be easily attached to a backpack, carry-on or other luggage. Additionally, many travel pillows will have straps or loops that allow you to secure the pillow to a bus or theater seat. Travel can be rough. You want a durable pillow that is tear and puncture resistant. While inflatable pillows are durable, they're also the ones most likely to be ruined by damage. One puncture and the pillow will no longer inflate. Down pillows, feather pillows and memory foam pillows are the most durable types of travel pillows. Memory foam, in particular, is very durable. The foam naturally bounces back from most crushing damage, which means you can stuff the travel pack in your suitcase without worry. Travel can be filled with spills, germs, and other environmental hazards. When shopping for a travel pillow, you want something that is easy to clean. Most pillows will come with a pillow cover. You want a cover that is comfortable against your skin but also stain-resistant. A machine washable cover is usually the best choice. Which Neck Pillow Should I Buy? The J Pillow has a one-of-a-kind “J” shape. This supports your head and neck while also preventing your head from falling forward. Because you can sleep comfortably while sitting in a small space, this pillow is popular among frequent travelers. But this pillow has plenty of uses around the home, too. The shape of the pillow relieves stress and pressure off your shoulders and arms. This makes the pillow a popular choice among those with chronic pain or temporary injury. Also, if you need to sleep upright at home due to a medical issue, the J pillow is an excellent option. This pillow lives up to its name with a soft, comfortable pillow. The high-quality memory foam provides full neck and head support. Not only comfortable, but this pillow also offers more therapeutic support than inflatable and filled pillows. The pillow is an easy-to-carry 12 by 11.5 by 3.5 inches. Elastic straps allow for easy attachment to your luggage or carry-on. The entire pillow is covered with a dark blue, machine washable microfiber cloth. Clean-up is as simple as running a load of laundry. Unlike many other pillows, the Comfort Master comes with a five-year money back guarantee. Not all neck pillows are memory foam. World's Best Airsoft Micro Bead Pillow is a lightweight travel pillow with comfortable micro beads that conform to your size and shape. The pillow has a super-fine plush upper shell and a spandex lower shell. This pillow is an excellent combination of both durability and comfort. The one-of-a-kind SpunGee filling is soft, squishy and moldable. Snaps allow the pillow to easily be attached to your luggage. The small size allows for storage both in the car and at home. While memory foam has a lot of benefits, don't forget to check out alternate materials. The World's Best neck pillow has a uniquely comfortable fill that doesn't sacrifice support. Travelmate’s Memory Foam Neck Pillow is all about conformity. The thermo-sensitive foam uses your body heat to perfectly conform to your head, neck and shoulders. This helps relieve pressure points which results in decreased shoulder pain, arm numbness, headaches, back pains and other maladies. The plush velour cover is removable and machine washable. While the neck pillow does have straps for easy travel, this is also a perfect pillow to keep around the house. 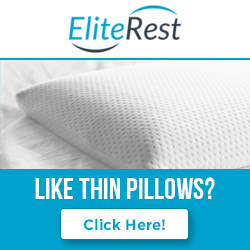 Orthopedic experts recommend this pillow for anyone with neck and shoulder problems as well as anyone with a medical need to sleep standing up. 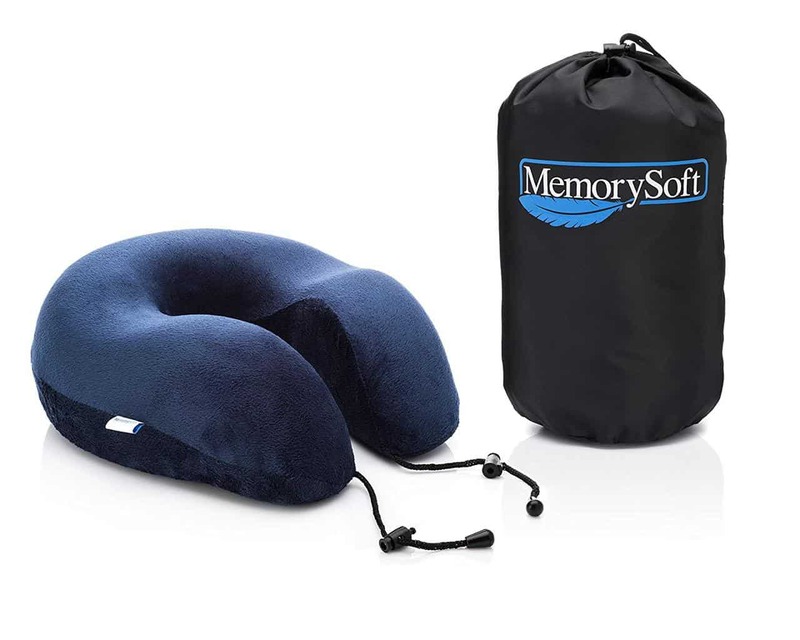 The MemorySoft Travel Pillow is a great deal. Made by a small, family-run company each pillow is designed to be durable and comfortable. The U-shaped pillow is made from contoured memory foam. Additional support is provided by toggle buttons. The entire pillow is covered with a plush velour fabric. This pillow is soft and comfortable, yet also easy to clean. Each pillow comes with a bonus black travel bag. With easy portability, this pillow works well on a car, truck, bus, train or plane. Use it around the neighborhood, too. It's easy to take camping, to the ball game or the beach. If you have any problems, the company's customer service provides a personal touch. All pillows can be returned for any reason within 30 days. Plus, each pillow is aired for several days, which eliminates that all-too-common memory foam smell found in other memory foam pillows. Neck pillows provide comfort and can help reduce neck, shoulder and torso pain. We recommend any of the pillows mentioned above. Each one is comfortable, supportive, easy to clean and easy to carry. So say goodbye to neck pain with a high-quality neck pillow.